The National Weather Service in Bismarck is helping to track a severe winter storm expected to hit the East Coast as early as today. The weather station has launched two extra weather balloons each day since Wednesday to help track the nor’easter, which is expected to dump heavy snow on parts of the mid-Atlantic this afternoon and into early Saturday. The National Weather Service predicts snowfall may reach 2 feet for some locations, including Washington, D.C., where more than 130 Catholic college and high school students from North Dakota are preparing for a March for Life gathering to protest legalized abortion. The event is scheduled to take place this afternoon. 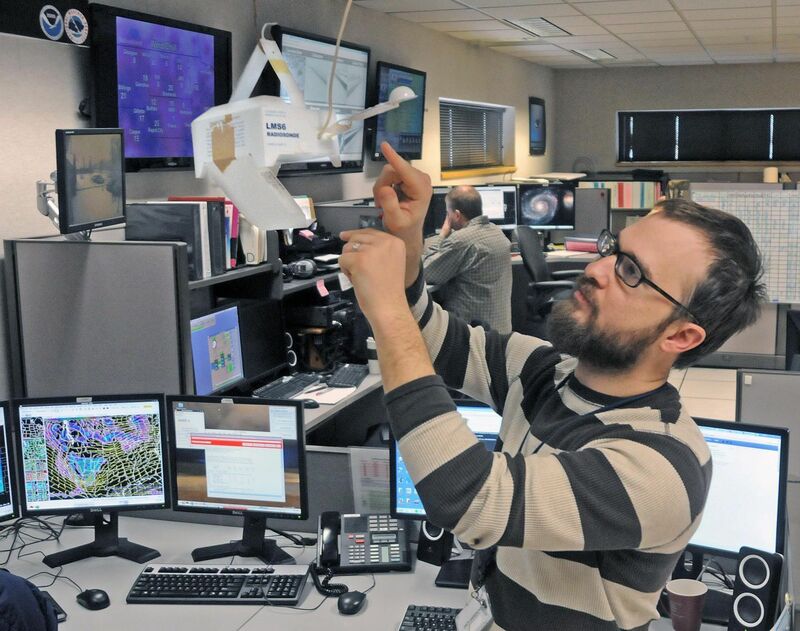 Zach Hargrove checks the radiosonde atmospheric data transmitter before its launch via balloon on Thursday morning in the National Weather Service offices in Bismarck. Hargrove, a meteorologist with the NWS, said the radiosonde can be recycled. For more photographs and a video of the balloon launch, go to http://www.bismarcktribune.com. Normally, the weather station launches hydrogen balloons daily at 5 a.m. and 5 p.m., Hargrove said. Hargrove releases a long piece of string attached to a 3- to 4-foot-wide white balloon on Thursday. Within seconds, the balloon is enveloped by a snowy background. Once it rises to an extremely high altitude, the balloon expands to nearly the size of a room at NWS Bismarck’s office, Hargrove said. The balloon is equipped with an atmospheric instrument, or a small white box called a radiosonde, that is used to sample the atmosphere. The radiosonde uses a radio frequency signal to track data on temperature, humidity, pressure and wind, which is transmitted to the Bismarck headquarters. “We can get all of that data every second as it’s going up into the atmosphere,” Hargrove said. The balloons can rise as high as 135,000 feet, Hargrove said. Once it meets the threshold, the balloon pops and a parachute attached to the radiosonde brings the device safely back to the ground. One it bursts, data stop collecting. The balloons can travel 60 to 80 miles away from the station, Hargrove said. Because the weather station doesn’t typically retrieve the devices, the radiosonde has mailing instructions attached for anyone who finds the instrument. Once, Hargrove said he tracked a device near Jamestown. That National Weather Service operates more than 80 stations in the United States that send balloons out twice a day. Hargrove said most of the stations that make up the eastern half of the country, including in the central and southern regions, were doing special balloon launches this week. NWS Bismarck is the only office in North Dakota that does the balloon launches, he said.